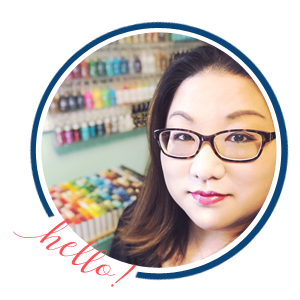 Simon Says Stamp Friendly Frolic Blog Hop (+GIVEAWAYS)! Good morning! I’m super excited to be a stop on the hop for the Simon Says Stamp Friendly Frolic blog hop!! Have you checked out the new release yet? It’s FANTASTIC!!! 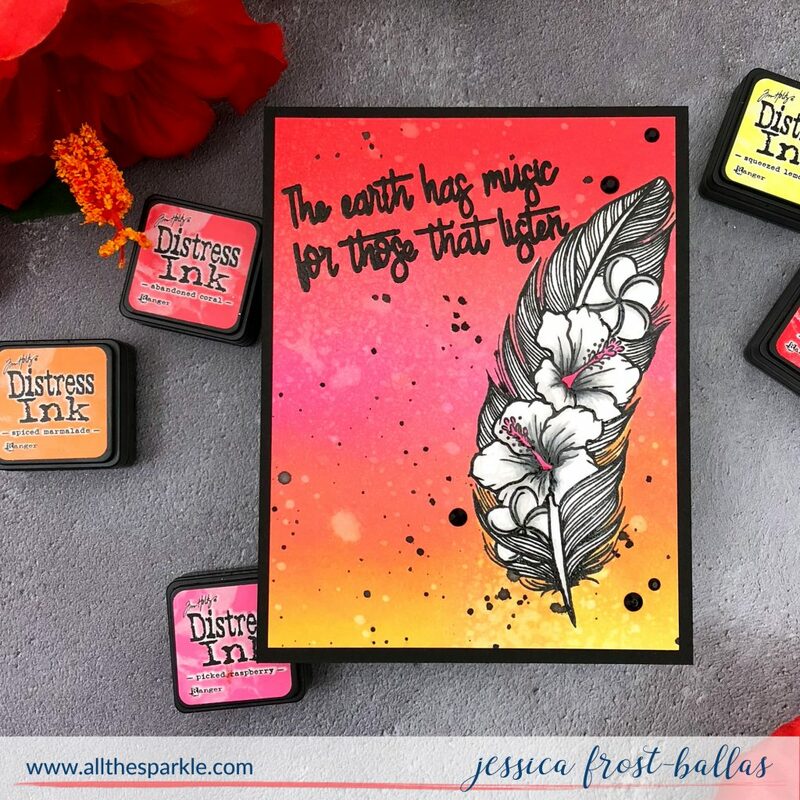 I’ve already shared three cards using the new release here and today I’m sharing another card using the gorgeous Earth Has Music stamp set designed by Stephanie Low! 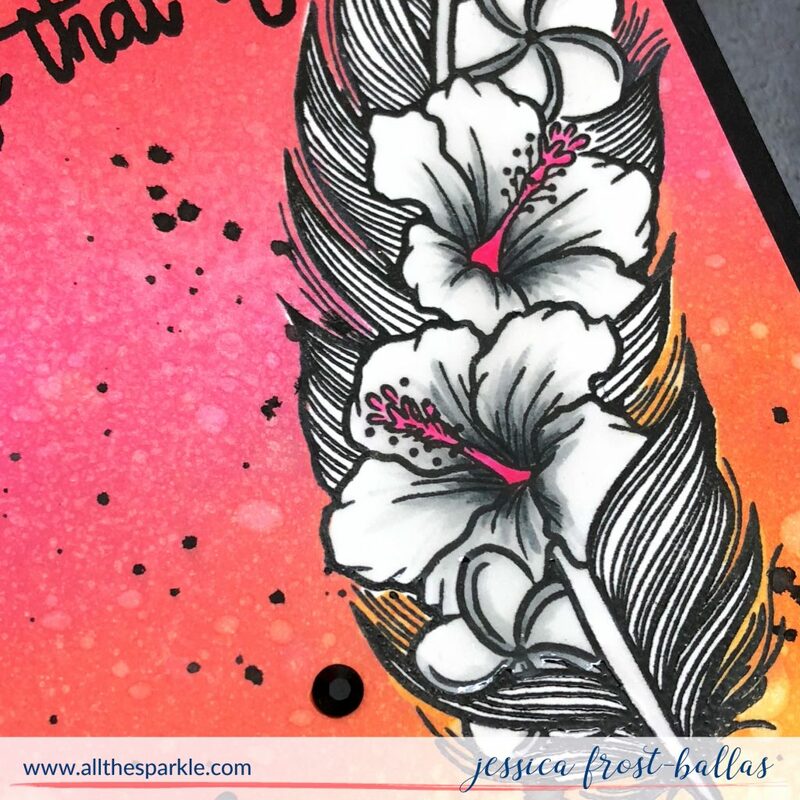 I just love this stamp set…the flowers mixed with the feathers are SO beautiful! I started by stamping the hibiscus feather onto strathmore bristol cardstock with versafine and heat-embossed it with clear embossing powder. I stamped it again on masking paper, fussy cut it and placed it over my embossed image. Then I blended candied apple, picked raspberry, abandoned coral, spiced marmalade, and squeezed lemonade distress ink over the panel for a tropical vibe. I spritzed it with water and clear iridescent spray and blotted off the excess water. Then I flicked it with black ink, remove the post-it notes, and let it dry. Once the background was totally dry I colored the flowers with copic markers. I added a little grey shading to the petals and then added bright pink to the stamens of the hibiscus flowers! I stamped the sentiment from Earth Has Music onto the panel with versafine and heat-embossed it with clear embossing powder. Then I trimmed the panel down and adhered it to a black card base. Finally I finished the card by adding a few black jewels and a thin layer of nuvo crystal glaze to the flowers! Check out the Friendly Frolic gallery on the Simon Says Stamp blog for even more crafty inspiration! And we have a special gift for all of our blog hoppers this weekend!! Use the code FREEG on any purchase at Simon Says Stamp this weekend for your gift! Thanks so much for stopping by, have a fantastic day, and enjoy the hop! « Simon Says Stamp Friendly Frolic Release! Love this background – beautiful colours! Gorgeous background, Jess, & the black & white feather really pops! Love the hot pink stamens! I love the absence of color on the stamped image & it’s contrast against the vibrant background. It is not something I would have considered doing until I saw this example. Thank you for the inspiration! I love learning/seeing something new & creative. This is beautiful! 🙂 I love the colors. Beautiful card from this wonderful release! There are some really magnificent stamps and dies, something fro everyone. 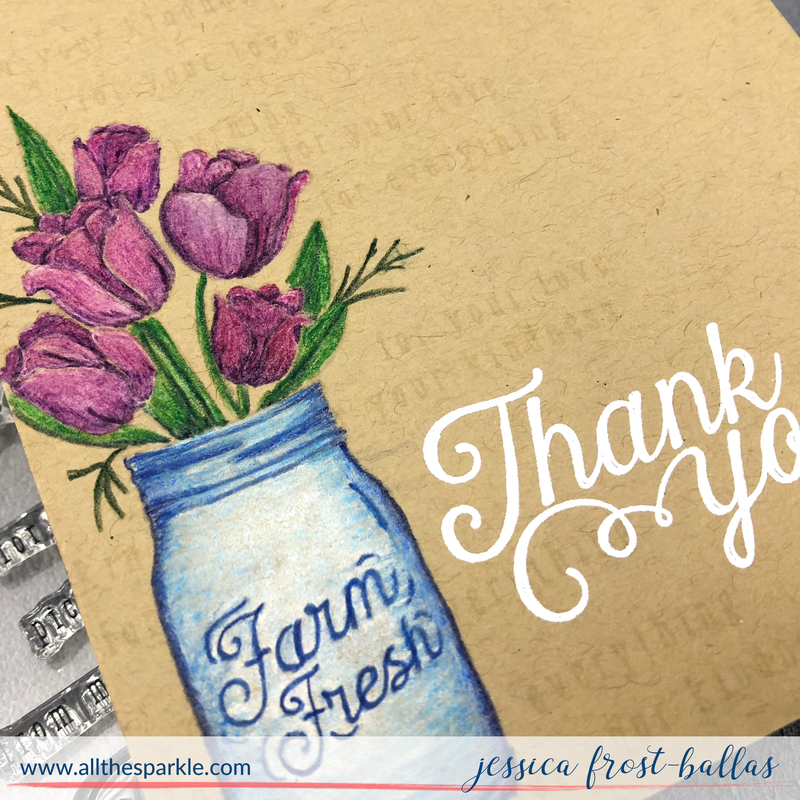 Love this card, Jessica! Such a unique stamp and I love how you decided to use lots of color on the background and more subtle colors on the actual feather. Really makes it pop! right in. And I love the mix of the flowers on the feather. This card is just amazing!! 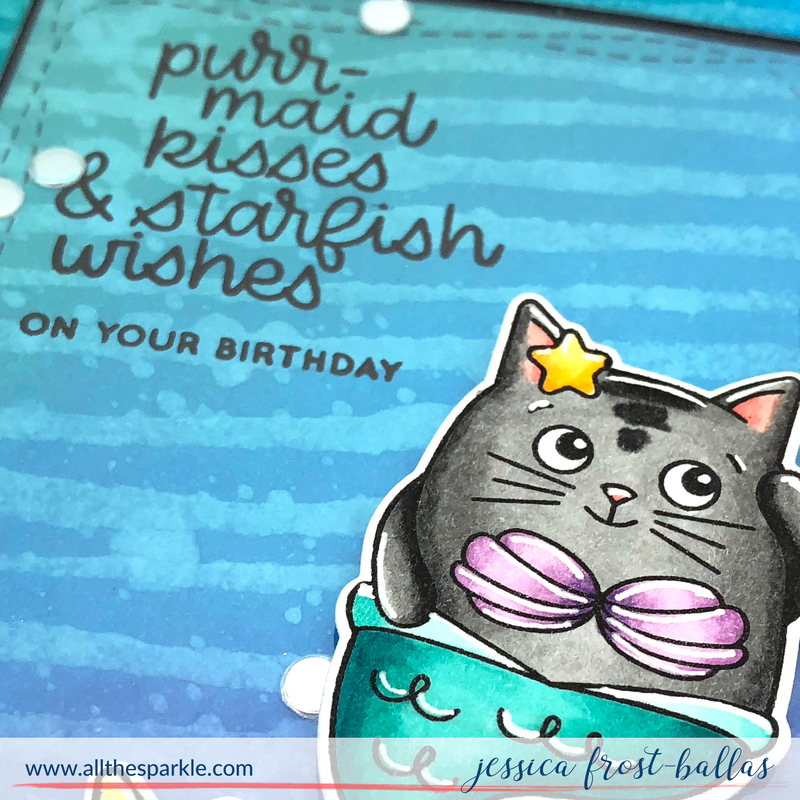 You always have such beautiful use of color, what a lovely card you made! The black and white really makes the image stand out against that beautiful background. Love it! WOW, this is beautiful, the contrast between the feather and background really makes a statement! Well done! I love All your cards, your use of color is amazing. Gorgeous card! Love the colors and that beautiful feather image! I love the beautiful, rich background that really brings out the dark lined details of your feather1 it looks AMAZING! Such a gorgeous card! So vibrant!